Catch-67: The Left, the Right, and the Legacy of the Six-Day War, the English translation of Micah Goodman’s 2017 Hebrew-language, Israeli best-seller, has debuted with strong reviews. 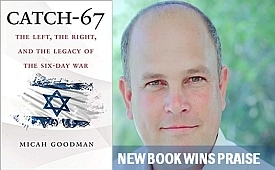 Stu Halpern, writing for the Jewish Book Council, said, "In Catch-67, already a bestseller in Israel, Micah Goodman convincingly argues that although each side of the Israeli political divide believes they know the path to solving "the Palestinian problem," both are incorrect. But at the same time, in their own ways, they are each also correct; that is what makes the issue so intractable." The Israelis in the center are not between the right and left. They are both right and left. That’s why we are so perplexed. The right is correct that a withdrawal would endanger Israel; the left is correct that a continued presence in the territories would endanger Israel. The problem is that since everyone is correct, everyone is also incorrect – and the State of Israel is trapped in an impossible bind. Catch-67 is published by Yale University Press. It was translated by Israeli journalist Eylon Levy.